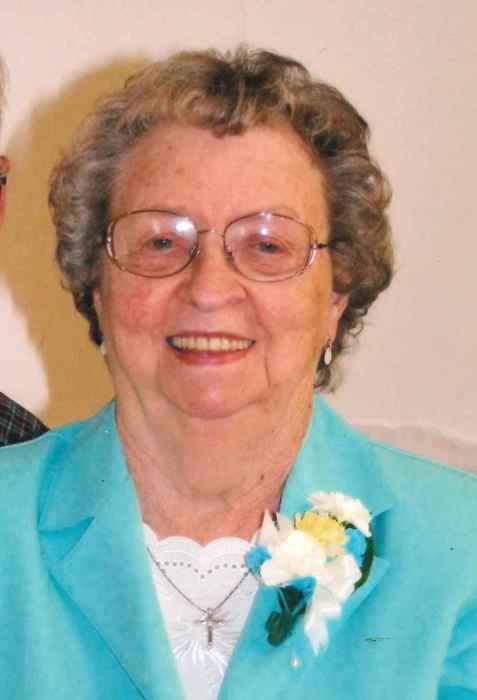 Dorothy “Dottie” Marie Johnston, 93, of Balsam Lake, Wisconsin passed away on Sunday, January 27, 2019 at the Lakeview Hospital in Stillwater, Minnesota. Dorothy “Dottie” Ruck was born on October 12, 1925 in Balsam Lake, on the Ruck family farm the daughter of Ernest “Jack” and Grace (Rogers) Ruck. Dottie lived her early life in the community attending Balsam Lake High School graduating as salutatorian. She worked at a local grocery store where she met Bud. He was the love of her life and they were married in 1947 in the local church where she was baptized. Dottie was a dedicated homemaker who loved to cook and sew, skills she passed on to their three daughters. With her Wisconsin background she enjoyed fishing and her culinary skills included wild game Bud provided. Dottie was a wonderful neighbor and friend wherever they lived in the Midwest. During their 60+ years of marriage Dottie and Bud began camping and traveling via motor home. They traveled extensively in the United States and internationally to Europe, Africa and New Zealand. In retirement both Bud and Dottie were active in the local VFW and American Legion. Dottie also remained active in Our Lady of the Lakes Catholic Church. Dottie leaves to celebrate her memory: daughters, Patricia (Donald) Frederick, Colorado Springs, CO; Susan (Joseph) Pleskac, Estero, FL; Janice (Thomas) Whistler, Brownsville, TX; grandchildren: Mike (Melissa) Frederick, John (Shannon) Frederick, Tim (Kate) Pleskac, Jeff (Tasha) Pleskac, Christine Whistler, James Whistler, Anna Whistler and David (Mandy) Whistler, great grandchildren: Ben and Alex Frederick, Dorothy and Mae Frederick, Quinn and Liam Pleskac, Riley and Terri Pleskac, Alexandria Burdette, Andy and Zander Whistler, her sister-in-law, Audrey Ruck, nieces, nephews and other loving family and friends. She was preceded in death by her husband, Art “Bud” Johnston, parents, Grace and Ernest “Jack” Ruck and her brother, John “J.R.” Ruck. A Memorial Mass will be held on Thursday, May 23, 2019 at 11:00 A.M. at Our Lady of the Lakes Catholic Church in Balsam Lake. Dottie’s family will greet guests at the church beginning at 10:00 A.M. Following the service please join the family for lunch and continued fellowship in the church social hall. Dottie will be laid to rest alongside her husband Bud at St. Patrick’s Cemetery. The family requests that memorials be given to either Our Lady of the Lakes Church in Balsam Lake, Wisconsin (ourladyofthelakes.ws), or the Alzheimer’s Association (alz.org) in Dottie’s name. Donations can be made directly to either organization or checks sent to the following address: Dorothy Johnston Memorial c/o Sue Pleskac, 9006 Astonia Way, Estero, FL 33967. There's still time to send flowers to the Visitation at the Our Lady of the Lakes Catholic Church from 10:00 AM to 11:00 AM on May 23, 2019.